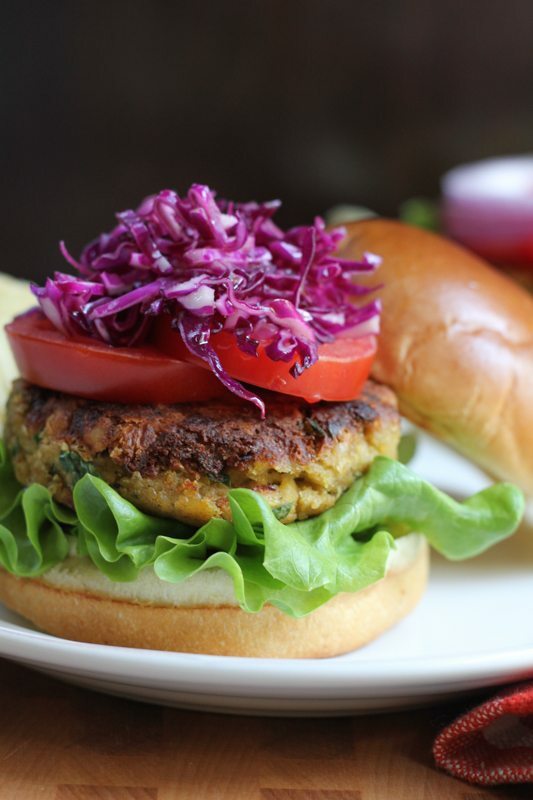 Packed with chickpeas, eggplant, zucchini and flaxseed meal, you have to try my Veggie Chickpea Burger! Full of flavor and healthy!! We’re more than halfway through summer and I can’t believe it. 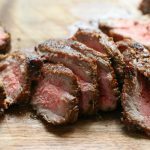 How many times have you guys fired up the grill for some nice juicy steaks or burgers? Since doing the Whole30, I definitely had my fair share of meat and it’s time to slow it down. And bring chickpeas back into my diet! Chickpeas or garbanzo beans? What do you call them? I absolutely love a good veggie burger (check out my Black Bean Quinoa Burgers and my Black Bean Edamame Burgers too!) and I’m going to try making a cauliflower burger .. yeah, y’all, you heard me right. . stay tuned. If cauliflower pizza crust is possible, why not a patty right? We’ll see if I can figure out a way to make it work. And until that can happen, I made this fabulous Veggie Chickpea Burger. You guys. This chickpea burger. It’s amazing. There’s, of course, garbanzo beans but I also added eggplant, zucchini, and . . . flaxseed meal in here. Yeah!!! My friend Rina had the brilliant idea of adding flaxseed meal!!! This is like the healthiest burger ever!!! And I used my absolute favorite skillet to cook these patties. I used my KitchenAid® 7-Ply Stainless Steel with Copper Core 10″ Skillet. 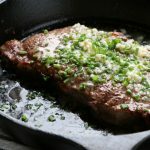 If you don’t have a skillet that you use all the time and love, then you have to check this one out! And make these burgers! Do you see that awesome exterior on the patty?!!! It’s because of this skillet! 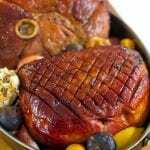 And weird food blogger side comment/question .. have you guys ever gone crazy trying to find the perfect “food item” to help style the photo or your plate? I purchased 3 kinds of potato chips because I wanted the perfect chips on this plate. The ridges!!! Small, minor detail . . and they are in the background but this is what I think about. Am I crazy?! Am I the only person that does this? Please tell me no. And you guys. . this red cabbage slaw on top of this chickpea burger was inspired by something I ate recently here in Madison at the Marigold Kitchen. If you guys are ever in Madison, this is the place to go to for brunch or a quick lunch. Great food using local and seasonal produce. I’ve been living off of this slaw all summer long! 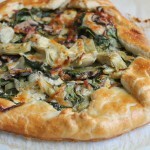 Check out my post and the recipe over at The Kitchenthusiast, too! Note for the cook: Be careful not to blend/pulse the ingredients for your chickpea patties for too long in your food processor. You still want some texture so the patties are able to hold together while cooking. Using your KitchenAid® 9-Cup Food Processor, pulse together the chickpeas, corn onions, grilled eggplant, zucchini, paprika, ground coriander and cumin until just combined. Do not over pulse, you want to retain some texture to your patties. Remove mixture from your Food Processor and into a large sized mixing bowl. Add in the panko, flaxseed meal and lemon zest. Using your hands or a rubber spatula, mix until combined. Add the egg, parsley and season with salt and pepper and mix again until combined. The mixture can now be placed into the refrigerator overnight in a sealed, airtight container, if prepping a day ahead. Alternatively, you can form the patties and place on a baking sheet or plate, using parchment paper to separate them and then refrigerate. Refrigerate for at least an hour before cooking. When ready to cook, using your KitchenAid® 7-Ply Stainless Steel with Copper Core 10″ Skillet, heat the olive oil in the skillet on the stove over medium high heat and after a minute or so place the chickpea patties in the skillet, I cooked about 3 at a time, and cook on each side for about 5 to 6 minutes, or until nicely browned, slightly crispy and heated through. 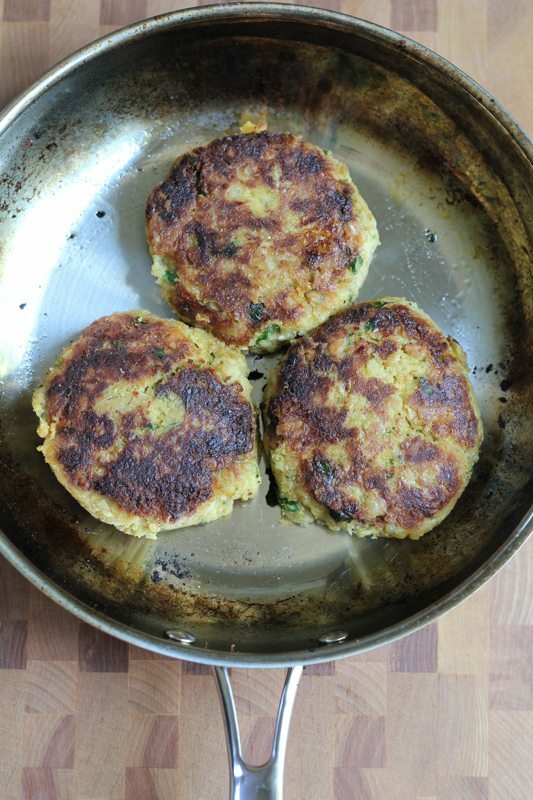 Repeat with remaining chickpea patties. Taste and adjust any ingredients as needed. 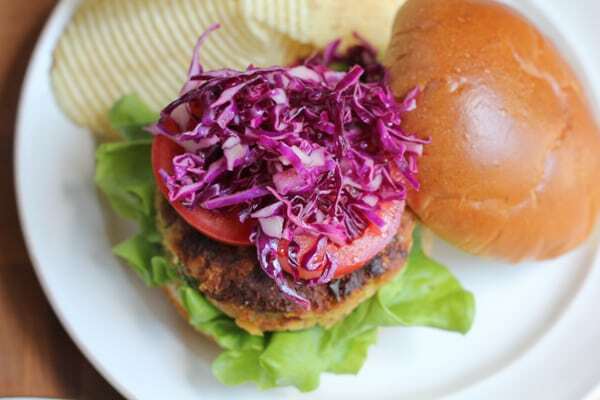 Place the cooked chickpea patty on a toasted brioche bun and top with lettuce, tomatoes, red onions, red cabbage slaw and squeeze on some Dijon mustard and mayonnaise or any other desired condiments. Top with the topside bun and enjoy while warm! 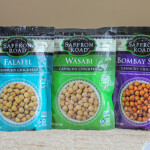 Crunchy Snack Chickpeas from Saffron Road + A Giveaway! 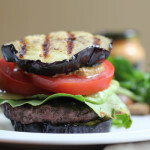 Grilled Eggplant Bun Burger + A Giveaway! Chickpea burgers are the best kind of burgers! I love the garnish you added here! I call them chickpeas, but either way, it’s one of my favorites! This burger looks amazing, Alice! I’ve never thought to add chickpeas to my burger before. I’m definitely trying this out! 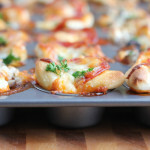 These look killer delish, Alice! Oh, and omg, I totally do the same thing with side items for styling the perfect shot, and it’s refreshing to know it’s not just me. I don’t think people realize how much of that type of thing has to go on behind the scenes to get a great shot. I am so bad about styling photos! As in, I don’t buy stuff to go in the background and I know I should, so the fact that you’re so good about it makes me feel majorly guilty now. That and the fact that you make your own amazing veggie burgers. I buy them frozen. But these look a LOT better! I am crying at the thought that summer is almost over! I haven’t eaten anywhere near enough veggie burgers…need to get this into my life! I am always on the lookout for a reeeeeally good veggie burger and I think I might have just found one. I am on a big chickpea kick at the moment. Eeek….I’m having anxiety about summer being almost over. Guess I better load up on as many summer foods as possible. I really love veggies burgers (and I’m a total carnivore). They just make you feel good when you eat them! P.S.S. You are SO not crazy. I do the same thing and drive myself up the dang wall in the “perfect search”. P.S.S.S- I made cauliflower meatballs, so Im sure YOU and your culinary genius can make a burger! Can’t wait to see it!!! Oh and I am eagerly awaiting a cauliflower burger from you, that’ll be awesome! Yes I totally go crazy looking for the perfect ingredient/props! These burgers look amazing! Love that you added in so much goodness. And I’m super excited about this upcoming cauliflower experiment. I’ll be patiently waiting for your results!! Veggie burgers for the win! I’m like, TOTALLY craving something besides meat patties all the time. Don’t get me wrong I love me some burgers, but we have them all. the. time. So I need this change in my life! And chickpea vs garbanzo beans -> chickpeas for me! I definitely call them chikckpeas! 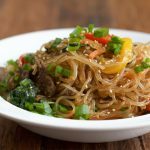 I have been looking for some more Meatless Monday ideas, and these are JUST that!! If you say they’re the best, then I believe you! Pinned! Chickpea burgers are my favourite! 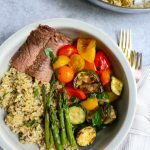 I love how you added zucchini and eggplant to these – they’re my favourite vegetables. Cumin + paprika + coriander are such a great combination of flavours too, these definitely have to be the best chickpea burgers EVER! This burger looks amazing Alice! I’ve never had a chickpea burger, but now I know I have to make one soon! 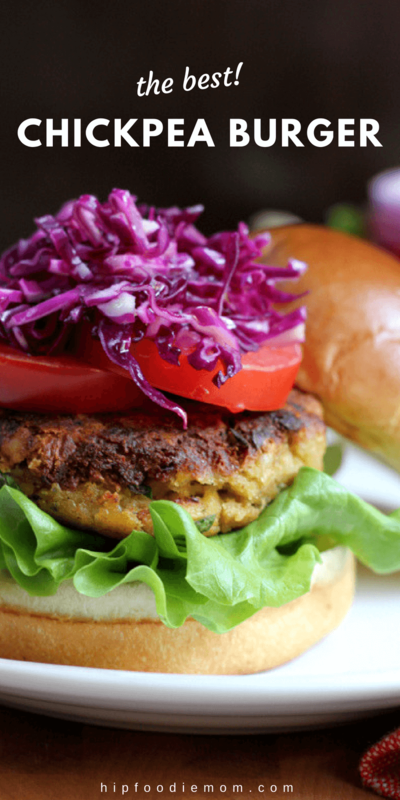 I love a good veggie burger – and this one looks ah-mazing! Man! This looks delicious!! I love chickpeas but have never thought to make a burger with them! Best chickpea burger ever? I would agree! I call them chickpeas. But I had some crazy town reader a couple years ago yell at me that “They’re garbonzo beans!! !”…so I try to refer to them as both when sharing recipes with them. Lol. Either way, I LOVE them. And these burgers sound awesome! Amy, LOL!!! ok, good to know!!! thank you!!! My daughter would love a cauliflower burger! She’s vegetarian and cauliflower is her favorite vegetable. Will have to try this chickpea burger. It looks amazing! I can’t believe summer is halfway through already too 🙁 We have been trying to soak in as much time outside as we can. 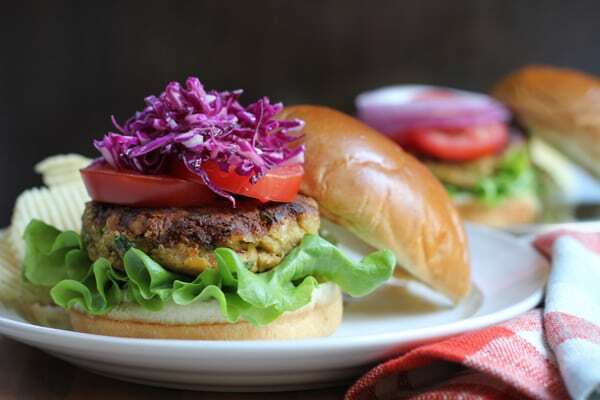 Love all the veggie goodies you jam-packed into this chickpea burger. It looks absolutely incredible! Can’t wait to see a cauliflower burger – that sounds SO good! thank you so much, Kelly!!! yes!! holding on to summer for as long as we can too!!! I love veggie burgers too but I’ve never made a homemade version. They look fantastic! I was just going through our calendar and can’t believe how fast it’s flying by. 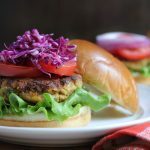 Love the zucchini and eggplant you tucked into this chickpea burger – looks so pretty with the purple slaw. haha, thank you Allie!!! I know you would appreciate something like that!! and YES!!! love my KitchenAid PAN!!! it rocks! Haha, those are some gorgeous chips Alice! And an even more gorgeous burger! Pinned! This is veggie burger perfection! 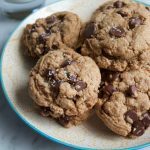 I’ve never made them at home, and I need to start with this one! Cauliflower sounds awesome, and I have I’ll be seeing a cauliflower burger here very soon! I’m a HUGE fan of chickpeas so I know I’ll love this burger!! Woohoooo! 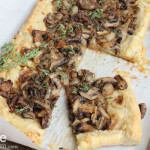 Another recipe that I need to try soon and it does look gorgeous. I call them chickpeas. I’m definitely going to try this burger while I wait for the cauliflower burger results! I’m headed over to ge the rest of the recipe! love this burger, looks delicious! I need to try the Kitchenaid pan! Sometimes I like veggie burgers even MORE than regular burgers. Beef burgers can be kind of heavy, but a veggie burger doesn’t leave me feeling like weighed down. Can’t wait to try this! I love these veggie burgers! And I totally stress myself out about getting just the right food props! It is something so small but something that will drive me crazy if it isn’t right! I love everything about this burger. The chickpeas, the veggies, the spices, the seasoning. OK, so I have to say I have never been tempted to make chickpea burgers before but your addition of corn is brilliant! Must make all the difference! I cannot believe we are halfway through summer either. It is flying by! I will make sure to fire up the grill and make these before summer is over! I think I tried making chickpea burgers once, but they completely fell apart (boo) and I never tried since. I think I need to retry sometime soon! 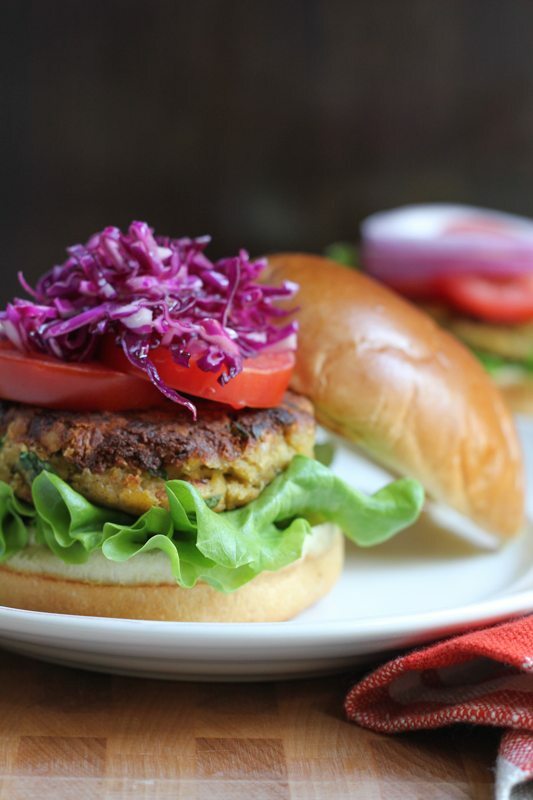 I am liking all of those veggies in these chickpea burgers! Now this is a burger! I love all the added veggies and those chips are a must too ;). Was so excited to see this on your Instagram feed, Alice – it looks amazing! 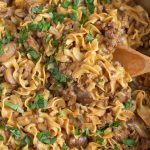 Can’t wait to give it a try for a Meatless Monday meal! Since you’re calling this the best chickpea burger, I have to take a close look! To speak the truth, I never believed in vegan burger. I just don’t know how I’m supposed to make a vegan patty works. Now I know!!! The corn and roasted veggies sounds so delicious and flavorful! And I can imagine the great flavor when these seasoned combined. And I believe it will only taste better. Can’t wait to try it out! Perfect option of a meatless meal! Definitely a winner! This is a meatless burger that would hit the spot!!! This burger has me so hungry right now!